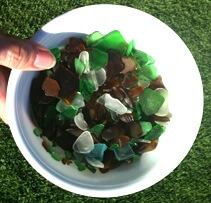 Science Fact: Sea glass and beach glass are beautiful artifacts of mankind that have been smoothed and eroded by nature. Sea glass has spent much of its life in ocean water, where the salt of the water and vigorous wave action not only weather the glass but also pit the surface. Beach glass on the other hand has spent its time in fresh water. At the Maui Gift & Craft Fair, held Sundays in Lahaina, I spoke with a man tending a table of silver jewelry, mostly earrings and pendants, made with sea glass. Like many who have adopted Maui as their home, he was generously decorated with tattoos. The man, call him Chuck, was enthusiastic and almost poetic about the joy he derives from searching for and gathering sea glass. And the jewelry? Chuck indicated his wife, seated behind a table, as the jewelry-maker of the family. They must have gotten a family rate on tattoos because hers were just as fancy as his. Her jewelry pieces usually consisted of a delicate cage of silver wire capturing a piece of sea glass the size the last joint of one of your fingers. Chuck explained that his favorite beach for picking sea glass was close to Lahaina Town. He would wade down there with a little shovel, digging under the top surface of sand and getting knocked against the rocks to the mystification of nearby beachgoers. He only keeps the larger pieces of glass he finds, those that suit his wife’s design approach. Although Chuck doesn’t bother with smaller pieces, other craftsmen drill them and string them as beads to make necklaces and bracelets, as you can see from one or another vendor on etsy.com, and jewelry makers on the West Coast and in Florida. What started out as a “what kind of work can we do that will let us live in Maui” fantasy became a business for Chuck and his wife, then developed into a passion for him. He has a mentor who has taught him that different pieces of glass tell their own history, especially some of the rarely-seen colors dating back to Lahaina’s nineteenth century whaling days. Whaling was truly a global business and archaeological finds such as glass bottles and their fragments are discovered in former whaling areas all over the earth. I saw a fascinating study from New Zealand of the artifacts left at a whaling station site on the North Island. Chuck also collects porcelain shards for his wife’s jewelry; he said that shards with glazed patterns on both sides were most often Chinese, those with a single-sided design Japanese. Science Speculation: Where there are collectors there are people who make a living selling to them. And when collectors pay hard earned specie for sea glass there will be imposters hoping to make money from glass that may have never seen the sea, or if so only for a brief time. If the glamour and history of sea glass tickle your fancy, there is a way to find sea glass of practically unimpeachable provenance – to pick it up yourself from its watery home. It takes a sharp eye at first but soon you learn to recognize the characteristic gleam of sea glass nestled in the sand or snuggling behind a rock. The photo in this post shows sea glass collected by my sister-in-law Corinne Tyler from a West Maui beach. These sea-worn fragments provide entertainment in many ways: the joy of the quest; the thrill of discovery; the wonder of holding history in your hand; and the reminder of sunny days spent in a tropical Pacific island. Sea glass must be one of the few collectibles that is made by people, re-shaped by unpredictable natural processes, then reclaimed by humankind once again. Have you ever spotted sea glass in a natural setting?